Regardless of industry, public or private sector, businesses everywhere are investing in customer self-service options to improve the overall customer experience. As more and more businesses and organisations embrace self-service, we’re beginning to truly understand what works and what doesn’t for ensuring customer satisfaction. In my opinion, it’s critical that a robust overarching strategy is in place to ensure that all the working parts are coordinated and integrated for the benefit of the customer. PCs are dead. We have seen a huge shift to mobile in the data available to us from our own customer base – 60 to 70 per cent of all traffic to council services comes from mobile devices (smartphones and tablets). So, digital service design today needs to deprioritise the PC completely as mobile devices will only gain greater market share tomorrow. In fact, mobile web usage overtook desktop for the first-time last year* and around four in ten internet users consider their smartphone their most important device for going online at home or elsewhere**. So, organisations can no longer build a service for a PC and then do a check to see if it works on mobile devices. Quite the opposite – the laser focus should be mobile – the device of choice. In the past, councils wanted a single view of a customer. But, in a digitally ubiquitous era, this is turned on its head. The priority is to enable customers to get a single view of the council. From a citizen perspective, it shouldn’t matter that there are 20 different council services or departments. There should be a single view of everything in one place, linking with the back office, but not trying to replicate the functionality of the back office – like so many citizen portals do. 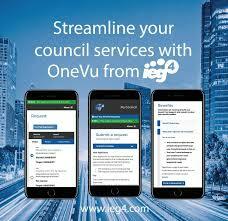 With the power of a single view of all council’s services, customers will want the information available to be reflective of their specific circumstances. Personalisation ensures that customers can be provided with custom experiences and get answers to their questions, which will reflect their specific accounts, claims and details. Rather than a simple static set of FAQs, a customer should be provided with dynamic answers to the council’s most commonly asked questions – with only those questions and answers and data specific to them presented directly from back office applications. This also extends to providing custom options, notifications and suggested actions based upon the customer’s interests, preferences and previous interactions with the council. Everyone is talking about AI at the moment and its uses across multiple industries. But how much of it is simply ticking a box to say, “we use AI”? The best thing to do is to consider it like one would consider any technology by asking: Will it solve a current/forthcoming problem in a way that’s better than those available now? AI is a wide-ranging subject area, but let’s focus on one aspect: chatbots. The question is – can a chatbot provide answers to a wide range of questions in a more effective and quicker manner than if they were fielded via a website, app or from a council worker? Our R&D illustrates that if a chatbot can only answer simple questions that would be available on a council’s home page anyway, it’s slower to get to the same information through this mechanism. So simply answering straightforward questions isn’t enough. It will not be enough to just be able to answer questions such as ‘when will my bin be collected’? A chatbot should, of course, be able to answer these queries, but it should also be able to recognise language nuances and pre-empt what might be asked next, and be able to learn from each interaction. And, the customer’s personal information should be able to be integrated to allow for additional use cases. Starbucks’ Barista chatbot is a good example – it uses AI to suggest orders before customers even think about what they want and make an informed guess on what they are most likely to agree to purchase next – again, learning from each interaction and becoming more intelligent in the process. Today, most dashboards and reports provide visual guides on things like performance in order that a human can act upon it. However, real insight should be able to be acted upon the instant it is derived. In the age of machine learning, insight garnered should be able to trigger updates to platforms automatically depending on these insights. For example, if hundreds of citizens are ploughing through several website menus to find the answer to the same question time and time again, these menus should automatically change based on this activity. That is to say, the website is able to be updated to promote this service, removing the poor navigation experience; without human interaction. Specifically, the system should learn what is needed based upon insight rather than someone having to interpret charts and carry out action based upon it. An example of this would be with monitoring council budgets. So, if there is X amount of money in the pot to distribute, for example, a Discretionary Housing Payment (DHP), the system should hold a certain amount of ‘rules’ that say whether a person would be eligible or not. If the budget is running out too quickly, the system should recognise this and change the ‘rules’ accordingly to ensure only those at highest risk would be provided assistance. Too many organisations are jumping on the ‘digital transformation’ bandwagon. Although change is good, there is no point starting from nowhere and then changing absolutely everything simply for the sake of it. Service transformation should be an ongoing process and it’s best to recognise that not everything needs to be overhauled or transformed right away. Going back to my point of personalisation and gimmicks, the main focus should be the customer, not how much you can make digital on day one. And, in that way, lies the best return on investment. I believe there is a certain amount of cultural fear when it comes to ‘going digital’ or automating processes. Change is often met with suspicion. But, for councils, automation presents a great opportunity to motivate and get the best out of staff, not necessarily replace them.